In the first instance, this may be the silliest thing I’ve ever done. It all stemmed from a conversation at the tail end of the school run, one afternoon last week. Daniel suggested – as we rounded the corner by the one-day-a-week bookshop and the Indian restaurant where Emily booked a surprise birthday meal back in the summer of 2009 – that ballet was not a boy’s thing, and that only girls did it. I immediately informed him that there was a thriving boy’s ballet scene, and indeed that one of the most famous ballets in the book, Swan Lake, was repackaged in an all-male form some twenty years ago. Ballet, I reassured them, required stamina and as much physical prowess as any sport. Girls could do it, and many did, but there was no reason why boys couldn’t follow suit. Sadly our children aren’t quite old enough for Billy Elliot. I could show them the T-Rex montage, I suppose, but it really doesn’t carry the same emotional resonance stripped out of its narrative. It’s one reason why I always get twitchy when I see the likes of ‘Memory’ performed at variety shows and revues, for example, because ‘Memory’ doesn’t mean a goddamned thing if you take it out of Cats. Similarly, Clint Eastwood’s “Do I feel lucky?” monologue at the end of Dirty Harry means nothing if you haven’t seen the earlier encounter (with a youthful Danny Glover, no less) in order that the two might be compared for tone, context and eventual outcome. You wouldn’t look up isolated scenes from Doctor Who and watch them on YouTube, would you? You would? Oh well, carry on then. But amidst the random thoughts and images that were passing through my head that particular afternoon, one got snagged on a stray branch and lingered, and that was my review of ‘Asylum of the Daleks’. It’s a rubbish episode, but it was around that time, as I remembered, that I first really started to notice Matt Smith’s tendency to lapse into dance routines. Oh, I know there’s a lot of dancing in Eleventh-era Doctor Who. There are so many GIFs of that ridiculous ‘Crazy Little Thing Called Love’ wedding scene that you could almost fill a Tumblr page with them. It’s probably got its own weather system. I don’t mean the dancing that is supposed to be dancing. I mean this. I know even less about ballet than I do about football, so yes, I’m sure the feet are wrong. He’s a Time Lord. They’re probably Gallifreyan steps. There’s probably fan-fiction. No, don’t bother looking it up. Things are much the same by the time we reach ‘The Rings of Akhaten’, an episode that features an awful lot of cavorting around the console, as only Smith knows how. That console has been the scene for many a merry dance, as multiple prior incarnations of the Doctor leap from switch to valve to dial to lever in the manner of Victor Frankenstein in his laboratory, before proclaiming (as Tennant did, in a sensationally stupid bit of revisionism) that the reason they did this was because the TARDIS is “designed to have six pilots, and I have to do it single handed”. I don’t think anyone actually believes this, any more than they believe River’s assertion that the TARDIS only wheezes because the Doctor leaves the brakes on. The leaping remains. But no one did it with quite as much visual panache as Smith did, and it really did seem to be the right moment to actually document this visually. Edward wouldn’t sleep Friday night, so he kept me company as we went through every one of the Eleventh Doctor’s episodes looking for appropriate visual material, which is far less tedious (and which took less time) than it sounds. 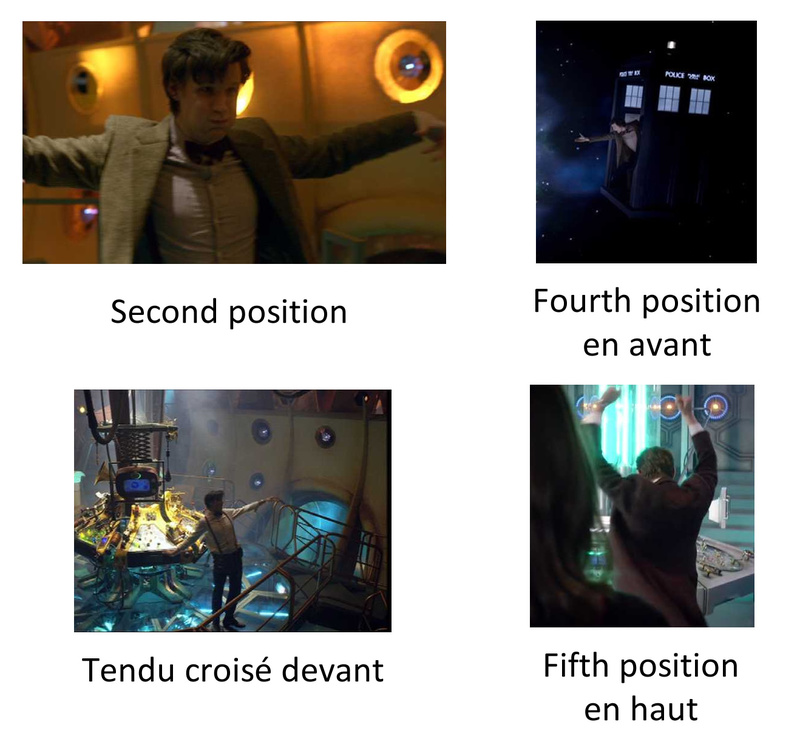 I wouldn’t pretend to be an expert choreographer, but I did at least try and match up the musical cadences with what the Doctor was doing, and I do hope that comes across. Musical choices were obvious – it couldn’t really be anything but ‘Dance of the Reed Flutes’. It’s just so airy. I went to see the Nutcracker years ago, actually, in Covent Garden, and thoroughly enjoyed the spectacle, even though there wasn’t much of a story (girl meets nutcracker / nutcracker develops sentience and fights off mouse / dancing confectionery). I had been ill the day before and the day after, laid up in bed with a stomach bug, when Emily came in to check how I was feeling. There’s still hope for my children, but I think I might be a lost cause. I think this is my favourite video you’ve done. I grinned the whole way through. I might be wrong, though, cos I just remembered the Kraftwerk Autons, which is mighty hard to top. While you were offline I developed a bit of a Kraftwerk fixation. I now realise it was a way of filling a you-shaped hole. Aww. You’re making me blush. How big was that hole and how much Kraftwerk was needed to fill it? !